Hi, I am interested in your 1954 Ford F100 (stock #1671-TPA) listed on Autotrader for $32,995. I'd like to get more information about this vehicle and confirm its availability. 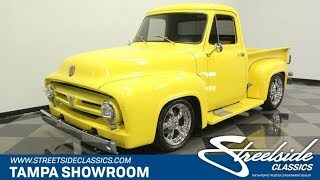 Slick, powerful, and completely custom, this 1954 Ford F-100 is the V8 classic with true distinction. The yellow paint on this truck makes it absolutely memorable from the first moment it comes into view. And the tight gaps mean the modern paint really rolls off all the classic curves beautifully. Competing with the paint for shine is a terrific brightwork package that includes the mirror-like chrome bumpers, delicate trim around the artful headlights, and the upgraded American Racing wheels with a 18/20 inch front/rear stagger for an aggressive stance. But as you look over every inch of this machine, you not only see great modern upgrades, but also a well-balanced sense of history. Thats why theres still nice wood on the truck bed, Ford step plates on the running boards, and the classic Ford emblem leading the way. Inside, the diamond pattern leather seats are a carefully crafted custom presentation thats youd expect on a modern luxury car. So its even more impressive in this classic Ford! Plus, the door panels even match this triple-tone look. They even got the details right with coordinating color on the headliner, carpeting, shift boot, and surrounding the steering wheel. And with the dash matching the outside yellow, the whole interior is a thoughtfully presented full uniform build. And with the upgraded floor shifter and auxiliary gauges, you can tell this one was meant to be driven. Tilt the hood forward to reveal proper Ford V8 power. The 289 cubic-inch motor looks nice with the polished valve covers and air topper radiating from within the black engine bay. Plus, this has been upgraded for power with a Holley four-barrel carburetor and Summit Racing intake. This also has the right supporting components, including good hoses, a trans cooler, and an aluminum radiator. And to make sure the drive is effortless, you also have power steering, front disc brakes, and a three-speed automatic transmission. This is the classic truck upgraded to look and feel fantastic. Dont let this F-100 slip away, call today!